Home Variety Satire Fact check: Did Kunal Kamra's tweets really lead to protests? Fact check: Did Kunal Kamra’s tweets really lead to protests? India is a democracy, where protests are used as a powerful weapon to register displeasure. Usually politically motivated, mode of protests range from lodging oneself on the sofa of the one you’re protesting against to just throwing milk and vegetables on the road, just because you can in the name of democracy. One of the oldest methods of protesting is raising slogans. Indian history is full of brilliantly coined slogans which changed our history. From ‘Simon, Go Back’, to ‘Tilak, Tarazu aur Talwar, Inko maaro joote chaar’ to ‘5 Saal Kejriwal’ to ‘Bharat tere tukde honge, inshallah, inshallah’, we’ve had both powerful and terrifying slogans which reflect the minds of our politicians. One such protest video went viral on social media yesterday, which according to the one who posted it was of activists who had taken to streets after reading propagandist masquerading as ‘comedian’ Kunal Kamra’s tweets. In the video, a woman seems to be leading the protest while sloganeering, ‘band karo, band karo, khule mein hagna band karo’ (stop defecating in the open). ‘Bahar mein jo hagega’ (the one who defecates in the open), followed by a crowd which says ‘apna ghu khayega’ (will eat their own excreta). While some may dismiss it as an awareness campaign to make India open defecation free, one look at Kamra’s tweets, one realises India has a long way to go until we achieve the goal. With a history of embarrassing tweets and playing the victim when being called out for his hateful behaviour, Kamra these days spends his time obsessing over nameless, faceless people over the Internet alongside women who get reduced to vaginas after watching a movie. The above video went viral after Kamra posted a tweet making fun of Jaapi, the hat-like headgear which is a cultural icon of Assam. 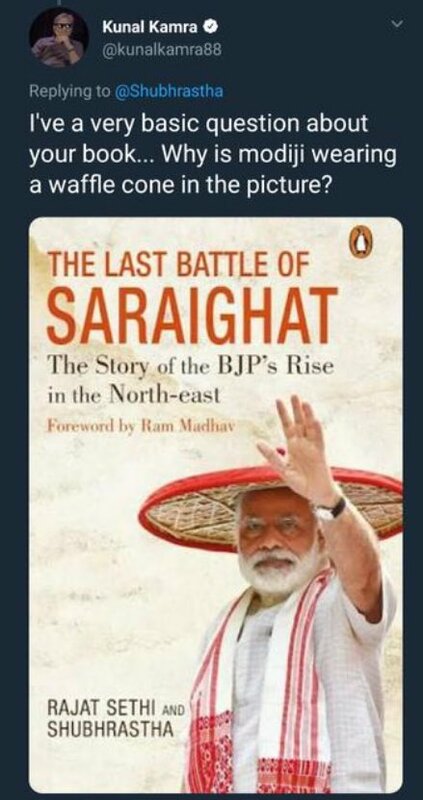 Kamra mocking Assamese culture to make fun of Modi. He referred to the Jaapi as ‘waffle cone’ and when his ignorance and arrogance was pointed out to him, he deleted his tweet. Kamra has since then ‘apologised’ for ‘unknowingly making fun’ of a cultural reference for Assam. So when the video went viral on social media, many people considered it to be true, because it really appears believable in a country where Arvind Kejriwal gets elected as chief minister twice. However, on closer inspection, we found that the above tweet was sarcastic, even though it seems genuine. Just as this article is sarcastic, though it may seem real. Very real.